Let's go and enjoy this wonderful documentory where you can see every season with beautiful pictures. AN INCONVENIENT TRUTH,from David Guggenheim, offers a passionate and inspirational look at one man's fervent crusade to halt global warming's deadly progress in its tracks by exposing the myths and misconceptions that surround it. That man is former Vice President Al Gore, who, in the wake of defeat in the 2000 election, re-set the course of his life to focus on a last-ditch, all-out effort to help save the planet from irrevocable change. Website realized with the collaboration of the one of the zoos through the world. It presents datas about more than 130 french zoos. The datas and thelatest news about the Asian elephants at the zoological gardens of the world. Complete website about zoological parks through the world. The part and history of the zoos. 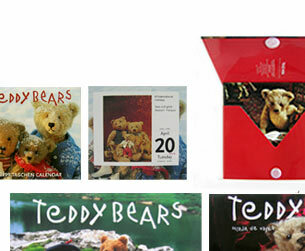 Website of the wellknown dutch teddy bears photograph : Mirja de Vries. Nice website, wonderful book A website to visit. Do you want to evade you thanks to photography ? Go and visit this website. A wonderful website to visit with nice bears photographs. Here is the website of Henry Ausloos, wellknown animal photographer since 30 years. See his interview in my topic "Portraits and interviews". The passion of nature and fauna have guided Hervé Ortega to photography. Visit his beautiful website with especially wonderful pictures of grizzlis and black bears. A website to visit and visit again. Look on this website an aricle about Vincent Munier. Association to protect threatened species. Canadian web site about the american black bear. A reading web site for young people. Alain et Isabelle Boyaval study the behaviour and the habitat of the brown bears, grizzlis and American black bears. They are passionned and dedicate their life to THE PROTECTION OF BEARS. Le site des collection de la marque Boyds . is a French non-profit organization created in February 1998, which promotes the image of the teddy bear for pedagogical, therapeutical, artistic and entertaining purposes. Oursement-vôtre is the main website about Teddy bears. I gave an interview to the webmaster. You can read it on the topic "Teddy bears lovers. A wonderful australian website to visit. To search about Teddy bears.